Cities were in the spotlight at the United Nations Climate Change Conference 2015, COP21, as the effects of urbanisation and climate change are converging in very threatening ways: Cities are high consumers of energy, produce more than 60 per cent of all carbon dioxide and significant amounts of other greenhouse gas emissions. On the other hand, cities are very vulnerable to climate change, with population and infrastructure at risk, especially in coastal areas. The Lima-Paris Action Agenda, bringing together both state and non-state actors to accelerate cooperative climate action now and in the future in support of the new, universal climate change agreement, highlighted the critical role of cities with a ´Cities and subnationals day´. 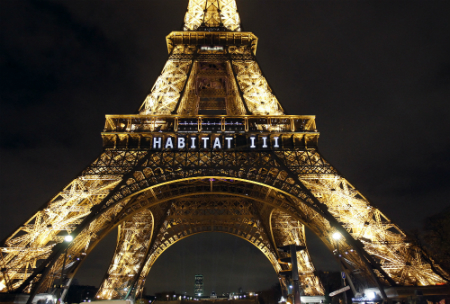 The question how the Habitat III conference can implement some key decisions from COP21 and how the various institutions presented are supporting the ambitious urban climate action was explored under this umbrella. In a key event on the new climate change agreement and the New Urban Agenda, ´One UN solutions for cities and climate change´, Maria Fernanda Espinosa, Ambassador and Permanent Representative of Ecuador to the UN, the host country of the Habitat III Conference, stated: “We need to create low-carbon cities while also combating poverty and exclusion’. The Sustainable Development Goal 11 ´to make cities inclusive, safe, resilient and sustainable´ thus should be key issues for Habitat III and the New Urban Agenda”. In this context, the inclusive process towards the Habitat III Conference received wide attention, especially the upcoming technical meetings and regional meetings for Africa, Europe and Latin America and the Caribbean. Christian Friis Bach, Executive Secretary and Undersecretary General of the United Nations Economic Commission for Europe UNECE, concluded: “If we succeed in the regional meeting and in Quito, we will contribute strongly to the implementation of the Sustainable Development Goals”.